Since last we chatted, dear Blog friends, we’ve been to Texas to celebrate our granddaughter, Emily’s, fifth birthday and her mommy’s somewhat older birthday.We’re doing our utmost, my joint tenant, John, and I, to put the best possible spin on the disaster which continues at our home. Our home which, up until now, has been a comfortable, roomy, beautiful place to live. Its one hundredth birthday will be in 2016 and, until recently, we had been planning a celebration...possibly involving family members, neighbors...some really nice champagne and something good to eat. Now, however, it’s gruel for all of us! House, family, joint tenant! And when our water bill arrives, our gruel ration will be cut drastically. Thinking we were doing the right thing, we spent several days sopping up the water in our carpet with every towel we owned. Seemed like a good idea at the time. Not!! We were wrong. Yes, disaster was underway. Mold is its name and mildew is its evil twin. The Titanic was a bigger disaster. The Sierra Madre earthquake was a bigger disaster. All hurricanes, typhoons, tsunamis, stock market downturns, floods and Albertson’s closing are bigger disasters, but when water is everywhere and people are breaking through your walls to set up blowers and dehumidifiers, your new carpet is history and your airline tickets are unchangeable...that feels like disaster. However, there is a blessing here: It didn’t happen while we were gone with water flooding unbeknownst to us for eleven days. As Prince Charles said, our jolly good disaster has us gearing up to replace all the galvanized pipes in our house with Flexpipe, a wonderful new type of pipe that, apparently, has the capability to bend around corners and will make our life permanently free from the specter of more broken pipes. We had a wonderful time in Texas, knowing our daughter, Patti, was here keeping an eye on the workmen who were systematically destroying our downstairs walls in search of moisture. We also were able to relax knowing we had turned off all the inside water and the gas to the water heater. 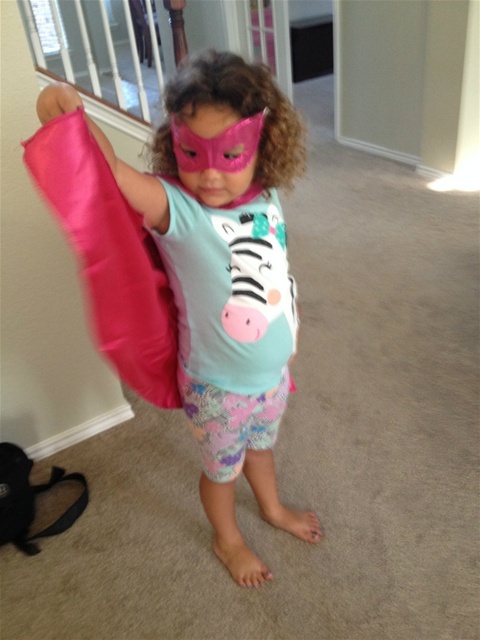 Emily had several splendid parties, received more stuff than Toys R Us, including the Barbie Power Princess Cape and mask you see her wearing here in her role as the Caped Avenger. We wined and dined, shopped, made fabulous breakfasts, visited the Perot Science Museum in Dallas, (really great and very kid friendly) and had a delightful time. Even had a splendid dinner with April Steele at the Main Street Bistro in Richardson, for those of you who know her. Celebrating Crissy’s birthday at the Silver Fox in Richardson with Chris, Jessie, Emily, John and Chris’s parents, Mike and Dianne, was so sweet. We have not been with her for several years on her birthday. Texas was even cooperative with their weather and resisted the urge to be 113 degrees, which it has been in previous Julys when we visited. As they are now out of drought conditions and have had more rain than anyone has seen for years, Texas is green and lush with overflowing lakes and ponds, ducks meandering across the roads. Sadly, all good things must come to an end. We returned to Sierra Madre, which is also beautifully green thanks to a bit of rain recently. Happy to be home, John turned on the water very slowly and carefully and not five minutes later, a new leak appeared in the ceiling. Turned the water back off, called Mike, he capped the pipe and now we have hot water in our kitchen, no cold. No washing machine water. Water in two bathrooms and one hose connection. We are grateful. But the water bill is coming. We are looking for the opportunity John D. Rockefeller assures us is in every disaster. These simple words by Annie Johnson Flint are so reassuring. Promising God will be with us no matter what happens in our lives. Like plumbing disasters. May you all have a great week and may all your plumbing behave itself.